Please copy and paste ' [[Category:Amphibians]] ' into the end of your article to include it in this category. Amphibians (class Amphibia; from Greek αμφις "both" and βιος "life") are a taxon of animals that include all tetrapods and four-legged vertebrates that do not have amniotic eggs, are ectotherms, and generally spend part of their time on land. 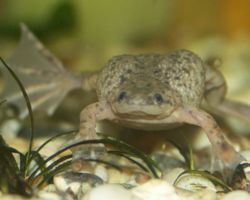 Most amphibians do not have the adaptations to an entirely terrestrial existence found in most other modern tetrapods. There are around 6,000 described, living species of amphibians. The study of amphibians and reptiles is known as herpetology. In the aquarium hobby, the most often encountered amphibian animals are Frogs, Newts and Salamanders. See here for a list of amphibian common names. This page was last edited on 24 February 2011, at 04:08.